Web browsers record everything you do on the Internet. This can be useful because when you want to return to a previously visited website you’ll find it in the web browser’s history. But it could also hurt because it exposes your private activity to prying eyes, who may sometimes want to do you harm, and you are particularly vulnerable when you share the computer with other people. But you can protect yourself. All web browsers have a feature that purges your web browsing history so that your habits can remain private. They work on the same principle, but each browser has a different method. We’ll explain how to delete your online tracks in all major browsers and on all major computers and devices and demonstrate how in the video above. Internet Explorer 11 (IE 11) is the last version of Microsoft’s traditional web browser. If you’re using an older version of IE you should consider upgrading because Microsoft stopped technical support for them in January 2016. Click or tap the cog icon in the top right corner. But in older versions of the browser, open the Tools menu. Now choose Internet options and, in the Browsing history section, click or tap Delete. Select the boxes that correspond to what you want to delete, then click Delete. In Windows 8.1, click Settings. Click Options and scroll down the list to find History. Next, click Select and select the Browsing history checkbox. Then click Delete. Open the Firefox menu by clicking the box made of three horizontal lines. Then, select History and then click Clear Recent History. In the Clear Recent History dialogue box that appears choose a time frame, and use the tick boxes to choose what you want to delete. When you’re done with that, Click Clear Now. Click the menu button at the top right – it’s a small box with three stacked horizontal lines – choose History and History again. To remove individual items from your History, click the down-pointing arrow to the right of the relevant entry and choose Remove from history. 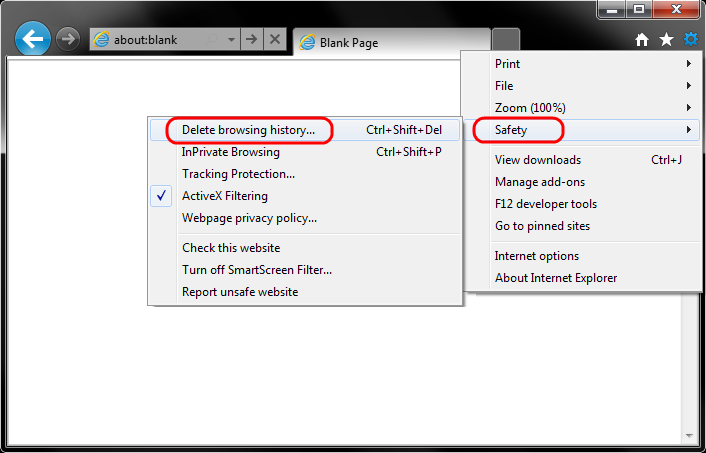 To delete your online past en masse, first click the ‘Clear browsing data…‘ button. Now choose an option from the Obliterate the following items from dropdown menu (choosing the beginning of time if you wish to wipe out everything) then click the Clear browsing data button. Edge is Microsoft’s brand new web browser which will eventually replace Internet Explorer. To clear all of your browsing data, click the options menu (the three dots situated at the top right) and select Settings. Under Clear browsing data, click the Choose what to clear button. Select all the types of history data you’d like to clear and click Clear.